Bankruptcy and collections work has overtaken other practice areas as the top source of malpractice claims at WILMIC, including in amount of dollars paid out. As we get closer to the end of 2018, it’s time to take a look back at the most common types of claims reported to Wisconsin Lawyers Mutual Insurance Co. (WILMIC) during 2018 and the riskiest areas of practice this past year. 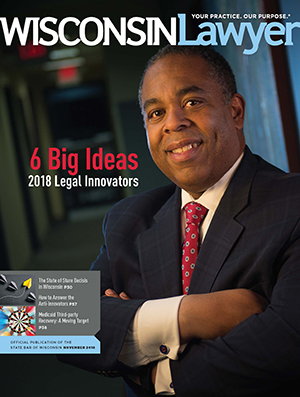 com Tom.Watson wilmic Thomas J. Watson, Marquette 2002, is senior vice president and director of communications at Wisconsin Lawyers Mutual Insurance Co., Madison. The good news is that WILMIC has seen fewer claims in 2018. So, lawyers are doing many things right. The areas of law that generated most of WILMIC’s claims were bankruptcy and collections, real estate, family law, plaintiffs’ personal injury work, and estate planning. Let’s take a closer look at some of the issues resulting in legal malpractice claims in these areas of practice. A family breakup can be one of the most emotional times in a client’s life – especially when young children are involved. Family law attorneys know all too well how difficult it can be to manage not only a client’s legal issues but also the emotions of the case. As mentioned, this is an area of practice that for years always generated the most malpractice claims. It also used to be the area of practice that generated the highest dollar amount of claim payments. Anderson says that for the past couple years, both trends have changed. “This year, so far, the sheer number of claims in this area only ranks fourth on our frequency list, and a distant second to bankruptcy and collections claims in terms of dollars paid out. The most common claims asserted against real estate lawyers involve failure to engage in adequate discovery and investigation to understand the parties’ intended use of the property being exchanged. General dissatisfaction with the amount of the attorney fees associated with the handling of the divorce or other family law matter remains a prevalent claims risk. Legal malpractice claims and OLR grievances can often be traced back to a lack of communication and the overall understanding that developed between the lawyer and the client at the outset of the representation. Here are Brian Anderson’s best practices for reducing the hazards of counseling clients with certain types of claims. Don’t dabble in collections work. The fee-shifting component of damages in this area of the law can result in expensive claim mistakes in a hurry. Clear written client communication explaining your role in the transaction is vital. This is especially important when the client’s objective is not to maximize the value of the real estate, such as a gift or deed to a family member. Provide frequent updates to the client regarding the status of their case. Include updated billing statements. An inadequate retainer at the outset is often the launching board for a claim or grievance when the lawyer later tries to withdraw or sue the client for legal services owing. Take only the personal injury cases that you are willing to finish. Weak claims for which you have no intention of ever filing a lawsuit are often overlooked and result in missed deadlines. Make sure filing and billing records clearly identify the client. Any estate planning instrument that results in an unusual distribution that disinherits a family member could later be scrutinized or challenged. Document carefully and precisely.